Where would New Orleans be without the legend of the Pirate Lafitte? Well, they would probably be still pretty well off, because they are not wanting for interesting historical characters, but still, he does bring a certain something to the already rich history of the city. For those needing a quick history lesson, Jean Lafitte (or Laffite if you will) was a privateer and smuggler who, along with his brother, Pierre, was very active in New Orleans and along the Gulf Coast between 1809 – 1819. Both Lafitte’s are often described as characters who, while doing bad deeds, had essentially good hearts and, for this reason, they remain popular in the New Orleans/ French Quarter identity. Apart from being famous for being a pirate, Lafitte is well-remembered for his role in the Battle of New Orleans, in which he is reputedly responsible for tipping General Andrew Jackson off to the British attack and, together with his privateer army, was instrumental in helping the American’s quash the British attempt to take the city. 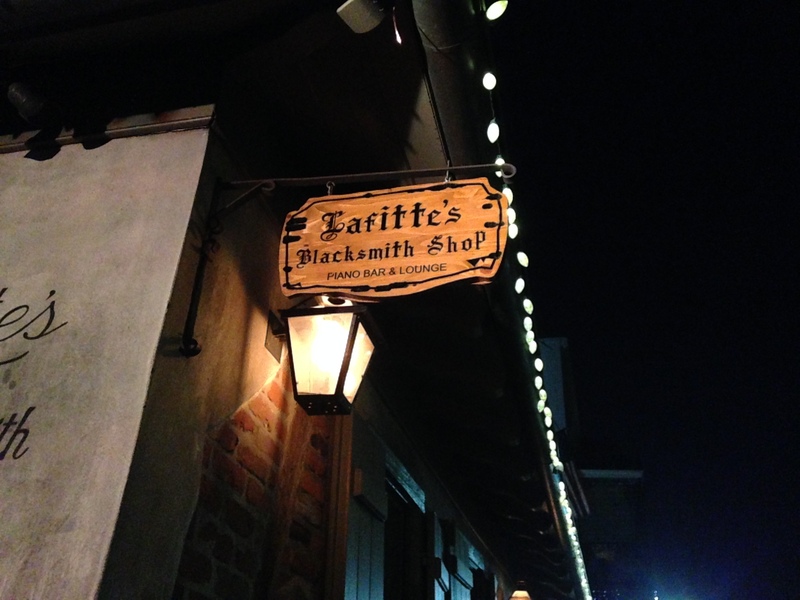 There is some contention about Lafitte’s Blacksmith Shop, which is reportedly one of the oldest buildings in the French Quarter and only one of three to maintain the French style (the other two are the Old Ursuline Convent and Madame John’s Legacy). While it is generally discussed as being the business front for the Lafitte brothers and their lucrative privateering operation, recent scholarship on the French Quarter has suggested that it is more likely the residence of Dominique Youx, one of their close associates (who often referred to himself as their half-brother, despite not having a clear kin relationship to either). James Caskey has claimed that title deeds for the area show that the spot on which Lafitte’s stands actually belonged to Dominique Youx, not the Lafitte brothers and that Youx initially operated a tavern at the location. Youx allegedly was well-known around the area for spinning fabulous yarns at the bar, which focused on the glory days of his life with the Lafitte brothers and their wild adventures along the Gulf Coast. According to Caskey, George Washington Cable may also be another possible candidate for the legend that the bar actually belonged to Jean Lafitte.Cable has written a huge volume of work focusing on the French Quarter and, while most of it is highly entertaining, it’s questionable how much of it could be described as truth. For the record, according to Caskey, Lafitte and his wife were thought to dwell on the opposite corner of the street from the bar, in a home which has long since been destroyed. So, if we’re to believe Caskey (and he does give a compelling argument) while the wild and wonderful stories of the Lafitte Crew are entertaining, they may not be entirely factual – but more of a case of exaggeration and truth bending. In any case, a trip to the Blacksmith Shop is still worthwhile for those who enjoy a good ghost story and a good hurricane (allegedly Lafitte’s make one of the best in the city). Personally, I hate the place. Not because it is dark, tiny, cramped and often filled to capacity with a drunken crowd who are either about to start their long night on Bourbon Street or are coming to the end of it, but because of the overpowering omnipresent atmosphere. I have never been inside Lafitte’s without feeling like someone (or something) is watching me – and it isn’t the bar staff or the patrons. There is just the spirit of unhappiness dwelling within the walls. Maybe there is something to the stories of restless pirate ghosts after all? Maybe hearing one too many ghost stories about the place has coloured my attitude, who can say? 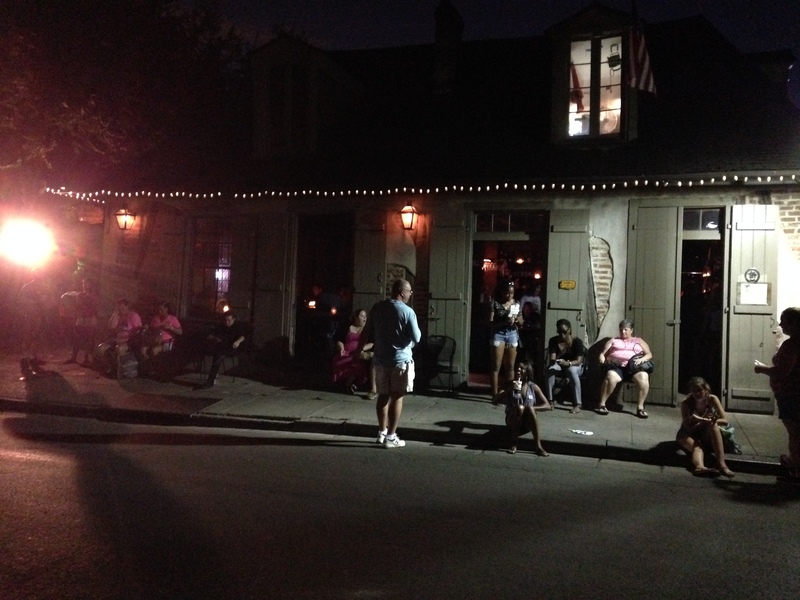 In any case, when it comes to Lafitte’s, I will happily wait outside. James Caskey. The Haunted History of New Orleans: Ghosts of the French Quarter, Manta Ray Books, 2014, pp.176 – 194.